Jamaica’s tourism authorities recently signed a memorandum of understanding with online travel marketplace Airbnb. Minister of Tourism Edmund Bartlett says the majority of the 1,200 accommodations in Jamaica registered under Airbnb are from Trench Town and other inner-city communities. Apparently many are not happy/supportive of this development and there lies my issue. Social media is dotted by negative comments primarily by Jamaicans. 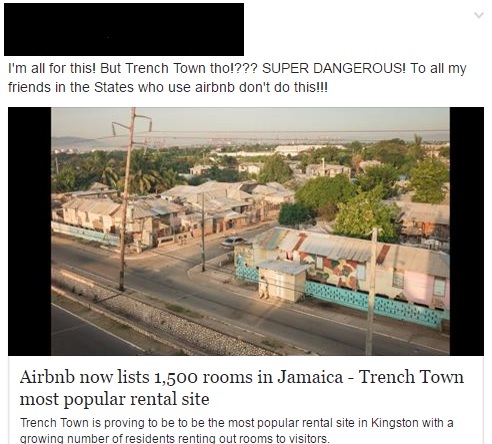 Comments range from disgust that “Trench Town” of all places being so popular to “For the love of god don’t go there it is dangerous!”. Trench Town is NOT as dangerous as many argue. With sensible planning, the taking the correct precautions which all sensible tourists would take when visiting ANYWHERE Trench town is a wonderful destination. Community tourism and the influx of resources in these communities is needed to uplift them instead of foreign-owned all-inclusive cages dotting the north coast where the money never trickles down to the regular Jamaican. In the 1960s Trench Town was known as the Hollywood of Jamaica, it is the birthplace of reggae and rocksteady, former home of reggae legend Bob Marley, home to the Trench Town Culture Yard Museum and has a rich history involving Irish immigrants from which the area gets its name. For all the naysayers this is exactly the kind of tourism Jamaica needs to uplift and empower its people so that EVERYONE benefits. Instead, we support a type of tourism that very few benefit from and the surrounding communities are perpetually trapped in poverty as its inhabitants are only needed to change the linen, cut the hedges, serve the drinks and gallop on stage on command.We should encourage and support these unique forms of attractions that cannot be bottled, repainted and resold the way sun, sea and sand can be. My uncles have 2 places in trench town just right above where Bob Marley grew up. Maybe I should tap into this.